Luke Cage, or Power-Man as he is also known, is a main character on Netflix Jessica Jones. Luke is a local business owner and entrepreneur who Jessica takes a keen interest in investigating for unknown reasons. Luke is generally a quiet and contemplative person with a mysterious past. He is also One Bad Mother F’r. As you may have surmised from his bulging, muscular build. Here you will find a guide to assist you in completing a screen accurate Luke Cage costume from his appearance in Jessica Jones. Besides being a huge pile of muscles, Luke’s appearance is pretty unassuming. His clothing style is pretty basic and versatile. His wardrobe consists mostly of simple v-neck shirts under a black leather jacket with jeans. 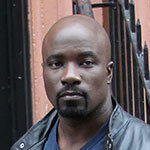 ​The first thing that you see about Luke Cage besides his big body, is his signature goatee. It is black and neatly trimmed and no Luke Cage cosplay would be complete without it. Another crucial piece of any complete Netflix Luke Cage outfit has to be his classic motorcycling helmet. For safety. Luke Cage has one main type of jacket that he is often seen wearing. It is a black leather, touring style motorcycle jacket. It isn’t the only jacket that he has ever worn but it is the most recognizable. ​This classic touring black leather motorcycle jacket is a perfect match to the jacket worn by Luke Cage. If you are looking to get a head start on your Netflix “Luke Cage” costume, we can help you out there as well. ​While not too much is known about the first season of Luke Cage’s Netflix debut, a few quality images have leaked ahead of schedule and we have a general idea about his basic appearance. I’m not certain whether Luke just likes his shirts tight, or he is so incredibly muscular that he explodes out of any clothing he attempts to adorn, but suffice it to say his shirts are usually pretty snug, so keep that in mind when planning your cosplay. ​This Red Kap zip-front work smock is nearly identical to the one worn by Luke Cage, unfortunately this particular item seems to be available only in navy blue while Luke’s is actually black. I don’t think it’s too much of a stretch, but you can decide for yourself. Luke has a small collection of different colors and style of v-neck t-shirts. The first of which to be discussed is his gray v-neck with pocket. Luke’s pants are nearly always jeans. So if you are looking to get into Luke Cage’s pants like you were Jessica Jones, the denim section would be a great place to start. ​These dark Levi's 511 jeans in slim fit style are nearly indistinguishable from the jeans Luke wears while on his chopper. ​These Kenneth Cole combat boots are a perfect match to the ones worn by Luke Cage while stomping the asses of anyone foolish enough to go head to head with the man with indestructible skin. Luke’s most reliable accessories are attached to his body. By that I mean his monstrous pythons of arms. Other than those, he does rely on a couple of everyday items to get through as well. ​This absorbent cotton towel is a perfect match to the ones used by Luke Cage to clean-up at the bar he maintains.